Rotherham manager Paul Warne will prepare for his side's Red Letter Day at Manchester City by meeting a potential new signing tomorrow. 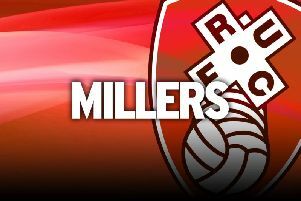 The Millers head to the Etihad Stadium on Sunday trying to produce one of the great shocks of recent history by taking out the current champions of England. But Warne's immediate focus is on player recruitment and trying to add to this threadbare squad, which is down to the bare bones. He will meet a target on Saturday and intends to meet another one next week as the January transfer window steps up. He does not expect incomings to start arriving until after the FA Cup action this weekend, but is working on deals. “I am going to meet a player, I am not going to tell you who it is,” Warne said. “Hopefully it will lead somewhere. “I was hopeful for trying to get someone in for this weekend. Most clubs, I understand why, are keeping hold of their players until the FA Cup weekend. Warne hopes to work his magic on persuading the target to come to the AESSEAL New York Stadium and he knows he will have to rely on the magic of the cup to get anything out of the trip to the Etihad. “I know whatever XI I put out on Sunday, they will give it a right go,” Warne added. “(We can win) with a little bit of magic and a wry smile. “We know how phenomenal they are, but our saving grace is in football you don't have to be the best team to win, it's an unfair sport. “You don't have to be the best team, you don't have to create the most chances, you don't have to have the most possession, you just have to score more. “Whether we can go to Man City and score numerous goals I don't know. It's a break from the Championship and the pressure of that, it's not a day out but it is a day they can remember for the rest of their careers.